Parks and Recreation exists to promote a wholesome, affordable and valuable recreation program for people of all ages and all abilities. The benefits of recreation are designed to meet the physical, mental, cultural, and social needs of our community and visitors, while enhancing the overall quality of life in Hartsville. Parks and Recreation also works in conjunction with Hartsville Area Recreation to provide well-rounded opportunities for athletic, non-athletic, and senior citizen programs. Funded by Darlington County and the City of Hartsville, Hartsville Area Recreation offers opportunities and special events throughout the entire year. Parks and Leisure Services is also responsible for the Hartsville Airport and city cemeteries. Click for the latest news from Parks & Recreation. The Carolina Thunder comes to Hartsville! Hartsville is excited to host the home season for the Carolina Thunder semi-pro basketball team, featuring Hartsville’s own Devontae’ Washington, for 2018. 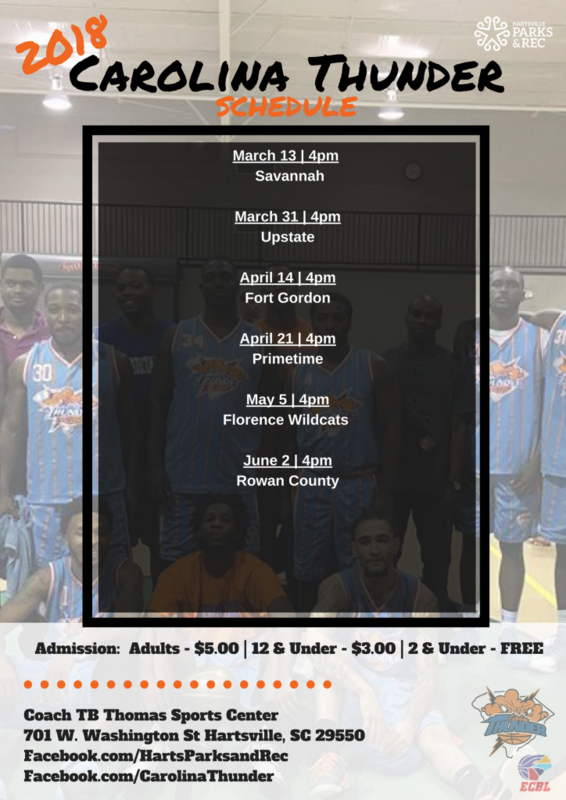 The Carolina Thunder, a regional semi-pro basketball team in the East Coast Basketball League, is having it’s home season in Hartsville this year. Games are $5 for adults, $3 for children aged 12-4, and free for children two years of age and under. For more information, contact Jessica Cohen at jessica.cohen@hartsvillesc.gov or 843.339.2878. Badminton and Tennis and Ping Pong, oh my! Pickleball is paddle sport created for all ages and skill levels. It’s inspired by badminton, tennis, and ping pong and incorporates elements from each. The rules are simple and the game is easy for beginners to learn, but can develop into a quick and fast-paced game. Every Monday, Wednesday, and Friday from 11:30 AM to 1:00 PM. 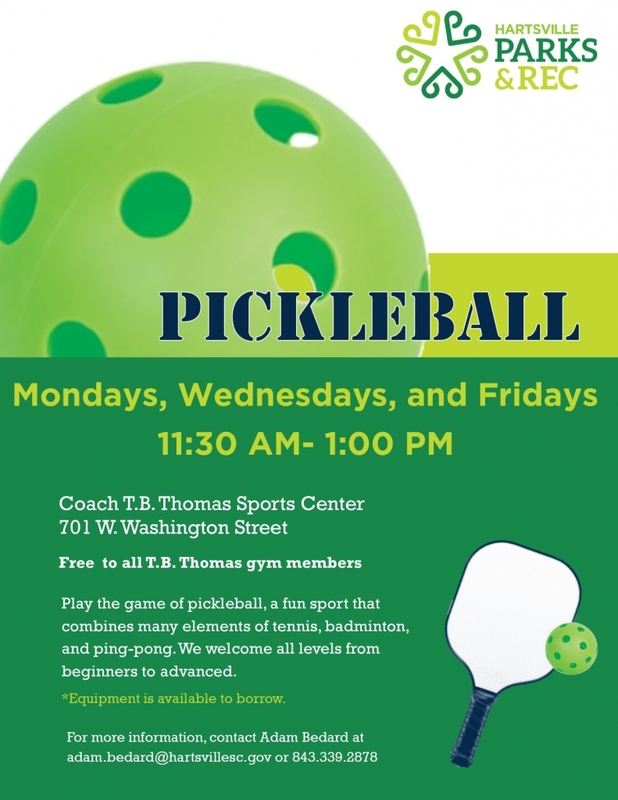 Come check out Pickleball with us! It’s really fun for all ages and is a great way to exercise. Games are free for members at TB Thomas Sports Center, others may join or pay a one-time fee per the Center’s rate schedule. Learn more about membership on the Parks & Rec site. For more information, contact Adam Bedard at parks@hartsvillesc.gov or 843.339.2878. Wanna play? Join the conversation on the Hartsville Parks & Rec Facebook page. Do you have an idea for a class or program you would like to see offered? Do you have a special interest or talent you would like to share with others? We are always looking for new program ideas and local “hidden” talent to teach or lead various recreational classes. If so, please email us at parks@hartsvillesc.gov or call 843.339.2878.